Mayor of Bartica Gifford Marshall hands over the trophy to River View Captain in the presence of teammates, Guinness Brand Manager Lee Baptiste (right) and Outdoor Events Manager Mortimer Stewart (second left) during the presentation ceremony on Sunday. 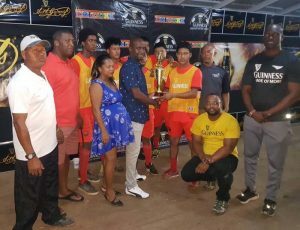 Streets’ Football Tournament after they prevailed 1-0 in a penalty shootout against Police as the curtains came down on the event on Sunday, at the Bartica Community Centre Tarmac. Played before another massive turnout that included Guinness Brand Manager Lee Baptiste and Outdoor Events manager Mortimer Stewart, the two teams battled to a 2-2 stalemate in regulation and extra time, forcing referee Wayne Griffith to order penalty shootout. In the shootout, Police got off to a disastrous start when the reliable Mark Boyce sent his effort wide, but River View was unable to take advantage when their shooter missed as well. Police’s woes continued when the next player missed the mark, before River View netted to take a 1-0 lead. Needing to score in their third attempt to stay in the encounter, Police for the third straight occasion failed to hit the mark, conceding defeat to River View, who walked away with the top prize of $350,000, the championship trophy and just as important a trip to the national playoffs. The Lawmen was rewarded with $150,000 and a trophy for their efforts. In regulation time, Gavin Gentle’s fourth minute strike had given Police the lead, hitting home a redirected pass. They increased their advantage when Boyce slammed in a powerful shot in the 13th minute to make it 2-0. Needing to respond, River View’s Stephen Edwards hit back one minute later with a stinging shot to reduce the deficit by one. Anzel Edwards then answered in the 26th minute to draw level at 2-2. In the third place playoff, Campbellville outlasted Potaro Strikers 2-0 on penalty kicks after regulation time ended goalless. Campbellville won $100,000, while Potaro Strikers received $75,000. Earlier, in semi-final action, River View squeezed past Campbellville 3-2. Romario Lake booted in a brace in the 23rd and 28th minutes for River View, while Andel Norton added the other in the fourth minute. For Campbellville, Marvin Jacobs scored a double in the 17th and 19th minutes. Police eased past Potaro Strikers 2-0 with Roderick Hamilton and Boyce on target in the 24th and 26th minutes respectively. The National Playoffs commences July 8. In the earlier exhibition rounds, Bartica Ladies defeated Almanac Girls 2-0, while River View Girls squeezed past Fal Mouth Girls 1-0 in a penalty shootout after normal time ended scoreless.